What is Christmas without music? The very theme of the season demands it. What with shepherds and the heavenly host doing a concerto of glory once upon a starry night more than 2000 years ago! The two can’t seem to be separated. Kampala during this season witnessed man’s allegiance to music, to celebrate the sacred. Never mind that a few people would be hard beat to acknowledge this with a beer in hand, dancing to tunes they would have already forgotten by the next day. Yet, since the two are intertwined, it was worth the while seeing it lived out in real life. Afrigo Band chose to celebrate its 36th anniversary during this season bringing up reminiscences we had comfortably bid goodbye to. There were other usual suspects as well to brighten up the season melodiously. It started out as a low-key event thanks to less than enthusiastic advertising on the part of the promoters. By 8pm, the Serena Victoria hall was just half-full and kept filling up ever so slowly even though the show had been scheduled to start at 6pm. But momentum built up as soon as the actual show started. The brilliant stage set-up was an encouragement amidst the long wait to the highly anticipated performance. It was frontal with two side lights crisscrossing. Together with lights from two tripods at the front, the stage was illuminated splendidly. A set of drums, two pianos, a saxophone, acoustic and bass guitar, traditional long drums and cymbals graced the stage invitingly; ready to revive 36 years of Afrigo band. Joanita Kawalya doing a rendition of her father’s songs performed first and her performances were characterized by energy and enthusiasm. ‘Minzani’ by the late AC class Kawalya in slow zouk brought the senior citizens present unto their feet to dance away to the good oldie. The much popular ‘Jim’ and the song that brought her into her own from just being merely Kawalya’s daughter, needed no introduction. Afrigo Band's Joanito Kawalya. Picture taken from Afrigo Band's Facebook-page from an earlier performance. For as soon as the band struck it up, the atmosphere turned electric and nostalgia ate up the hall sweeping the audience back to the early 90’s. Still caught up in that wave, ‘Semuwemba’ played next. Even I could not help but laugh at the memory of us kids playing and dancing to the tune. The song is about a married woman warding off the ostentatious attentions of an ardent suitor. The queen dancers not to be left out of the shrilling performance wiggled away in their yellow skirts and tops with a bare mid-rife. Later, Kawalya was to pick a guy from the audience to dance away her father’s ‘Susanna’ in Rumba style. 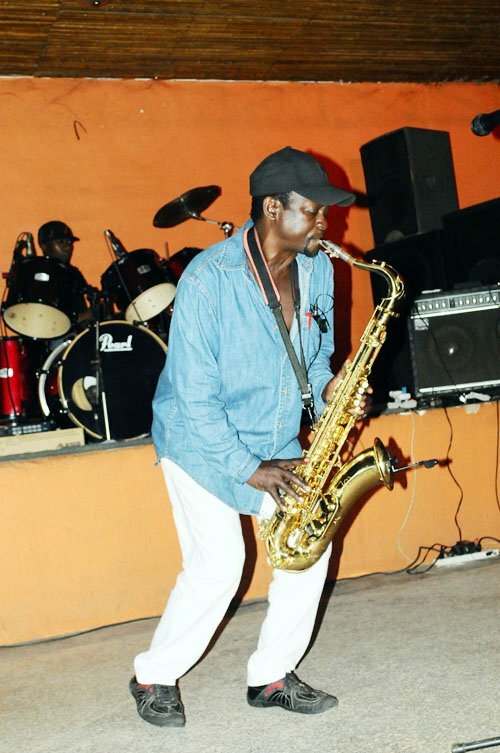 Yet for all the audience’s familiarity and enjoyment of Joanita Kawalya’s songs, it would not be an Afrigo night without Moses Matovu and his beloved saxophone. Afrigo Band's Moses . Picture taken from Afrigo Band's Facebook-page from an earlier performance. The legendary maestro began with, ‘Lwaki Onumya,’ much to the audience’s approval. ‘Silina anantwala mama, Silina anambikka,’ followed with that unforgettable line, ‘Omuwuulu takoowa kwaala bulili.’ Meaning the bachelor never tires laying his own bed. But if there was a song most waited for, it was Rachal Magoola’s ‘Obangaina’, a considerable hit in 1999. When it was played, the audience seemed to know every lyric of the song. It’s about a notorious woman namely Margaret who steals someone’s darling man and the father of her children. ’Mwana omuwala antwalila daalingi wange!’ The line goes. 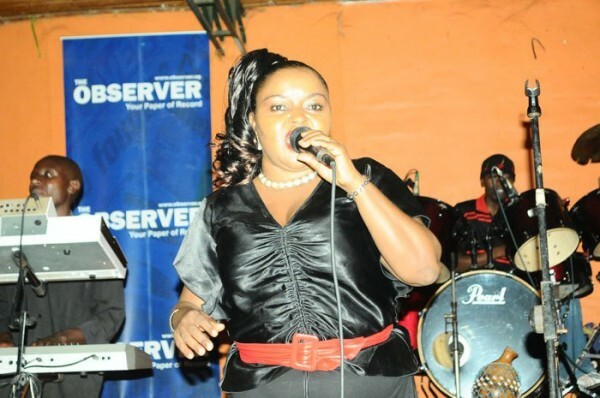 Her love for Busoga where she hails from was clearly evident in her songs. She took us across the Nile to dance and celebrate the kyabazinga of Busoga with greater fervor and passion. Together with the queen dancers, she enthralled and captivated, leaving the audience yearning for more. More performances continued well past 11pm. Watching people enjoy themselves, one could not help but notice that it was an event someone’s parents could only enjoy. There were a few young people present possibly because their parents had loved Afrigo music and they had grown up listening to it too. Mulindwa Herbert, a 40-year old peddling music in Bakuli said: “This is due to the fact that the band has failed to capture the current generation with its live “band music. The hits have been few over the years almost dwindling out. “Generally 90’s music was sophisticated and well thought out compared to today’s which is mostly ‘Kindandali’ (noise). Maybe that is why they have failed to recapture the market,” he added. He striked a point as most of the composers that the band takes after, the likes of Fred Kigozi, AC class Kawalya and Peterson Mutebi would not easily be seen having a musical dialogue with the likes of Bobi Wine, Paddayman Steve Jean and Benon Mugumbya of Swangz Avenue; spinners of today’s most popular music. These are two camps of people hailing from different music worlds. But that was not to say that a few of those spinners were not in attendance. Steve Jean, a popular music producer though manning the sound was very much in attendance and so was Isaiah Katumwa, a Jazz saxophonist. “36 years of Afrigo Music is such a milestone. Very great music is all I can say,” said Michael Ouma, an accomplished acoustic guitarist and a hit with music lovers. The next stop was Watoto church on 18th December who had a Christmas presentation themed ‘One child’. After a run-through of Christmas carols by a pastor, the show opened to dazzling lights against a background of falling snow, ancient Palestine depicted on stage walls and choir ethos of ‘O come Christmas come’ resounded powerfully in the ancient Noman Cinema now turned church. Men in tuxedos and ladies in red dresses with black sashes, tectonically positioned on a raised carpeted stage, cut the picture of class and elegance. Their soulful voices cut through the hush and eager expectations of the faithful that Sunday morning. Rather than divulge directly into the well-known Mary and Joseph holding the infant Jesus scenes, it was an aged Mary who narrated to the audience – through her memoirs – the story of the first Christmas as the world came to know of it. Those strange and dramatic events that took place more than 2000 years ago. Later, we were introduced to a noisy background depicting the registry at Bethlehem. A vocalist in a leather jacket starts to sing to soft rock and makes a startling contrast to the elegantly dressed choir. The contrast goes vocal as well as the flashy disco number fails to sit in with the choir. A guitarist tries to save it with strums that turn and twist, but still the rocky ‘Immanuel’ comes off as loud and funky and fails to communicate to the audience. Throughout the presentation Mary cajoles her audience to embrace obedience trusting God to lead them even though at times nothing makes sense. She takes us through her struggles of not being easily believed and accepted even though the child she carried was holy seed. Some part of the audience was moved while for others it was merely just a performance. For a church that has faithfully given the city of Kampala a professionally done Christmas presentation for over ten years, the first performance opened generally to positive reviews. Post Christmas, 27th December, had the pragmatic David Nsaiga at the Serena Garden roof top staging a show dubbed “Christmas peroxide”. ‘Pragmo’ – as he is popularly known – is best known for doing acid jazz, a music genre that combines elements of jazz, funk and hip-hop and looped beats. A style developed in the UK over the 80’s and 90’s. Naturally in attendance were young people in their late twenties and early thirties who have inclinations to sophistication and adventure powered by their ability to have well paying jobs. A far cry from the Afrigo audience! Pragmo performing at Serena Hotel rooftop. Photo by Gerald. The show kicked off at 8pm as advertised and we entered to soft Jazz playing in the background as the night breeze floated in freely. Although scheduled for the swimming pool area, a last minute change moved it to the current venue, for which it was best suited for. A nervous Pragmo stood briefly at the entrance donned in a doctor’s coat and his signature trademark, a hat. Not sure if his audience would show up as expected and his wife Norah, his event manager patiently serving tickets. 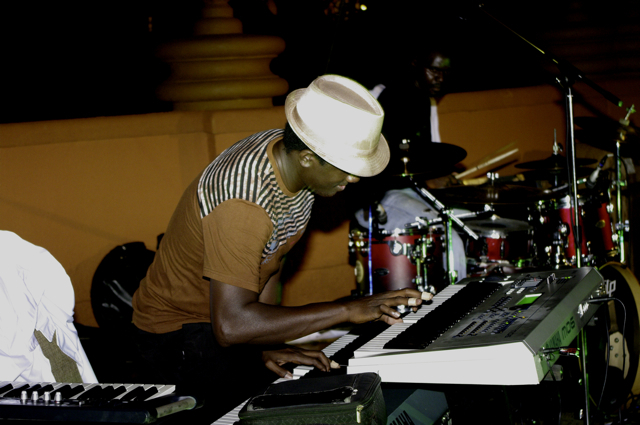 That was before he hit the stage of three pianos manned by him, a bass guitar by Martin Mutabingwa, a drummer dubbed as the machine, Dj Twonjex mixing the music, and Solome Ndikatuuga, a vocalist. 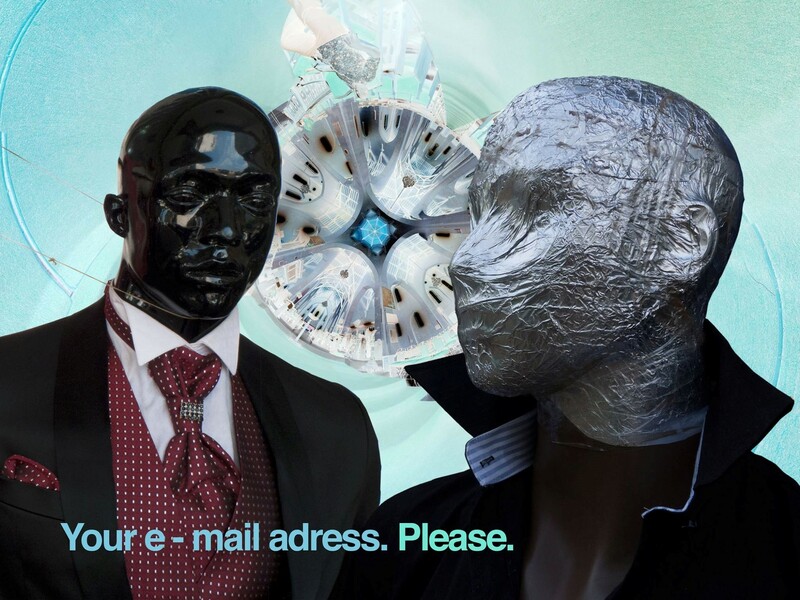 His fingers moved across the three keyboards with speed and precision to produce a sound definite projecting onto a known destination. Tingling, caressing the keys, evoking sounds and events you would easily pass off to an audience, intent, slowly taking in Pragmo who was everything but nervous. He managed to create a relaxed atmosphere enabling people to carry on their happy banter while not entirely forgetting him. Solome singing ‘Sweet Love’ with a Jennifer Hudson feel and attitude followed with a rendition of Tracy Chapman’s ‘Natural Woman’. She proved to us her wide range and confidence as she flung arms and voice in the air to ooh and aahs from the encouraging audience. After a short break midway, Pragmo introduced his guest artist, Charlie King, who at one time was an international success based in Sweden where he has lived for over twenty years. Charlie King dominated the second phase of a show with a hit parade of songs in from the 80’ like ‘Let’s Get It On’, ‘Stuck On You’, ‘Lovely Day’. 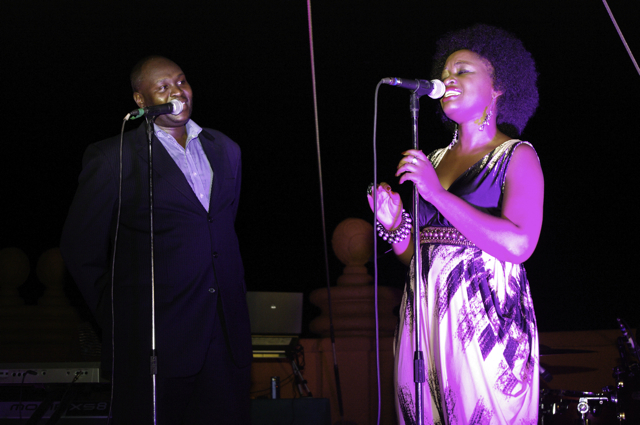 Charlie King and Solome Ndikatuuga performing at Serena Hotel rooftop. Photo by Gerald. He added to the acid jazz show groove and attitude, prompting some people to dance along with him amidst the empty glasses of soda and beer and coffee cups on tables. Not forgetting the season, Rucci of Limit X fame – when invited by his pals Pragmo and Charlie King to the stage – sang “J.E.S.U.S” a hit popular in the day when Limit X was Uganda best gospel music export to the outside world. Charlie King amazingly never did any of his songs, but went karaoke. Later, Norah explained that the band had not learnt any of his original compositions yet. But since he is going to be performing with Pragmo at the Serena Garden rooftop every Tuesday, those who are interested will surely be able to see him doing his original music. By 10pm the show was over and Pragmo read his thank yous to the organizers and appreciated his audience for coming. I don’t know where you were this festive season, but wherever it was, hopefully some good melody kept you going to evoke the Christmas spirit.